Hey - check this out! I've taken this whole post from the OutdoorKnit blog - but it's such an awesome idea that we should all get behind it! there are a few very tall lamp posts outside the New Dowse in Lower Hutt, and OutdoorKnit decided it would be a pretty fun idea to turn them into something different...trees! What OutdoorKnit needs is lots of knitted, crochet or even sewn flowers, leaves and native birds to cover these 'trees'. The best medium for this is acrylic - it wears better when the weather gets a bit grotty. And the rest of you can sulk for a minute, but then head straight to Spinning A Yarn's felt store and buy some for yourself. Boxes are now on sale at www.blendy.etsy.com! 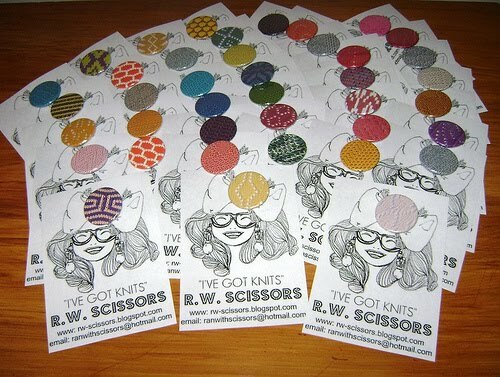 Check out more from RW Scissors, and visit them in real life at various craft markets around Auckland, especially Kraftbomb. Jacqui from Wool Things has sent in a huge case of wonderful merino sliver! Each sample is a hugely generous bag of single-coloured 19 micron merino fibre. There is quite an assortment of colours (the picture shows just a few), so if you are a spinner and manage to buy a sampler box, you can message me with your favourite colour and I'll do my best to make sure you get something you like! Wool Things factory is situated in the small country town of Eketahuna in the lower North Island of New Zealand. On your next road trip, why not make a stop. 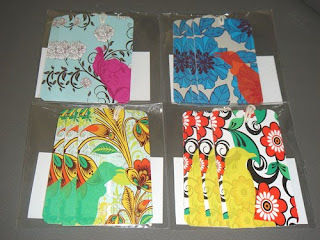 Vintage Purls have very kindly sent a big package of patterns to go in the NZ Yarn Sampler Box. Most boxes should receive this Blue Sky Baby bobby sock pattern! How fun! 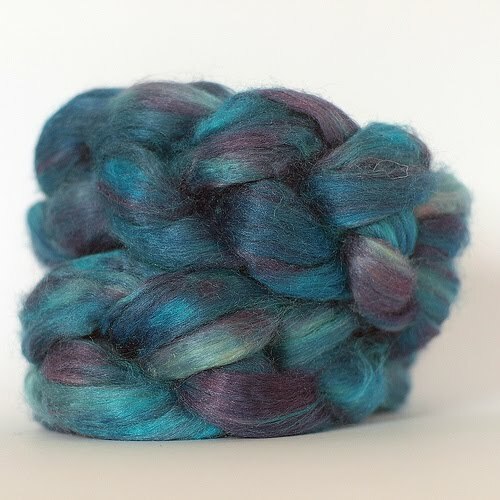 It uses under 75g yarn, so why not give it a go with some of your sample yarns. Blue Sky Baby is a toe-up pattern. Work as an ankle sock for a interpretation of the 1950s bobby sock or make the leg longer for a warmer option. 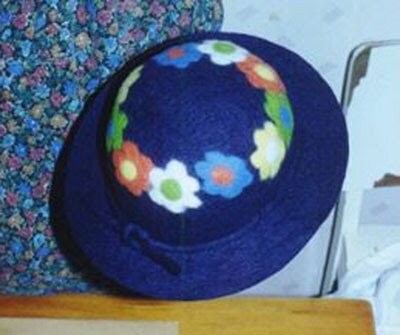 The lace stitch for this pattern comes from a 1937 jumper pattern. The lace repeat is just four rows long and quick to knit. For a twist on conventional sock construction the gusset is on the bottom of the foot, it lines up nicely with the bottom increase for the toe. A traditional french toe gives three radiating lines for an interesting and eye catching look. The picot hem is a pretty finish to any lace pattern and is nice and stretchy for ease of wear. Make sure you include @blendy if you're using Twitter so that I can see your entry, and everyone else can either reply in the comments of this blog with your entry link, or email me if you prefer so I get your entry. (Don't send me the statement above - I want to see the link to where you have told the world about the competition! eg paste it into your Facebook or Twitter status). Good luck! 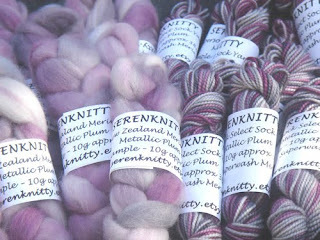 AND.... don't forget the NZ Yarn Sampler Boxes go on sale this weekend!!! 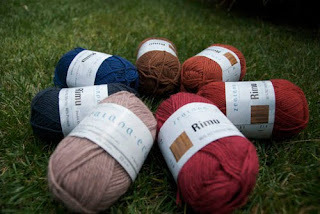 Once again, we are very lucky to have the very generous Fab Fibres samples in the NZ Yarn Sampler Box. There are so many different colour mixes, it's just wonderful! These sampler bags are an ideal taster for crafters who use yarn for embellishing, scrapbooking or creating a wide variety of crafts. You get a skein of mixed yarns, plus a 10m hank of metallic yarn - they are all so beautiful and I'm sure I could think of a way to use every one of these myself!! 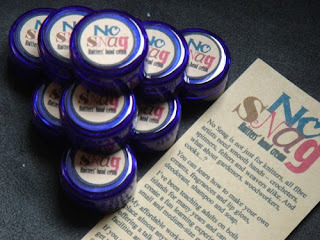 These are great items we all need in our stash for making something look extra fancy. And if you have an interesting craft in mind that needs something that little bit more special, then check out Fab Fibres and be amazed. 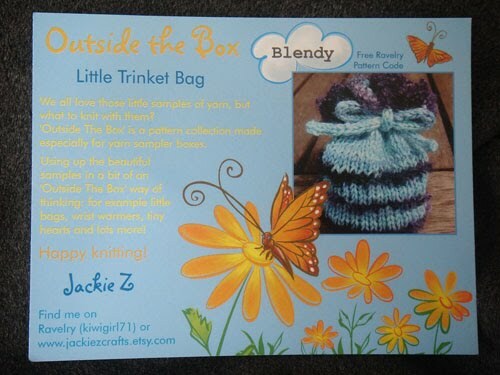 Jackie Z (or kiwigirl71 as you may know her on Ravelry) has sent in this really cute pattern to make a Little Trinket Bag using various samples from your box. What a great idea! All boxes will receive her pattern card, or if you miss out on a box you can download it free from her ravelry page, using the code 'Blendy'. You can also check out her other patterns for small things to make using sampler box yarns (including some super-cute socks) , and also some very impressive hand made soaps at www.jackiezcrafts.etsy.com. I recently went to a 1930's themed wedding, so I decided to crochet a snood. 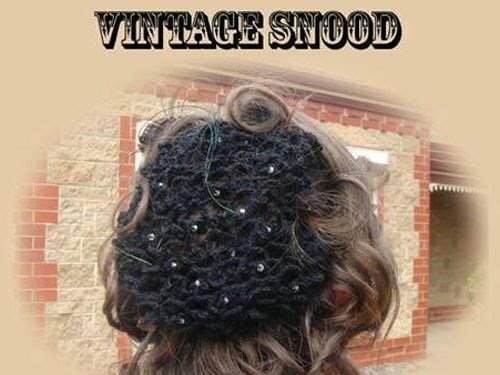 I had no idea what that word meant until I did a bit of research, but it is the term for those crocheted hair nets the women used to wear. I found a few patterns, all suggesting you make many in various colours and sizes for all occasions. I ended up making up my own pattern, based loosely on a few that I came across, and I wanted to share it! All boxes will contain my pattern card. It is a bit hard to see in the picture, but it is a crocheted netting with flowers on some rows. I've also added in some beads as a feature on some of the flower centres. I had intended on having my hair styled in 1930's curls, and the bag would hold the hair - my hairdresser had other ideas however, and pinned it on like a little beret, but it still looks fun! 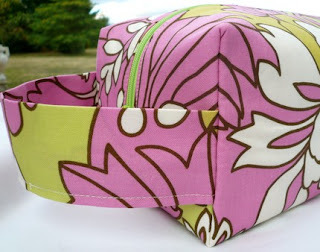 And best of all, you should be able to make this using one of the sock samples in your box. If you are a Needle Food addict like myself, then you will already know how great this sock yarn is to work with, and you'll just be buying it immediately without waiting for your sample. If you are yet to be converted, then browse their extensive catalogue (it includes sock, worsted and lace weight and you can even have things custom ordered) - and by that stage you probably won't be able to wait for the sampler box either! As you drive north and south from Auckland, you have probably seen (and hopefully stopped in at) the Mohair Craft shops at the Motorway Service Centres at Bombay and Dairy Flat. They have a great selection of yarns available, both for knitting and spinning, and also plenty of other crafty gift ideas. Mohair Craft have very kindly sent an enormous parcel of beautiful Kid Mohair Yarn for the next NZ Yarn Sampler Box. Each sample is a huge 50g ball, so this is a very generous submission! There's a wide selection of colours - the photo shows only some of the available samples. You'll love receiving this sample in your box! Mohair craft use only the finest Kid Mohair available to make their premium Kid Mohair products. Kid Mohair comes from the younger and better bred goats and is noticeably thinner and softer than the adult mohair and young goat mohair used by most Mohair product suppliers. You will be amazed how soft and luxurious their kid mohair products feel compared to products made with young goat and adult mohair. 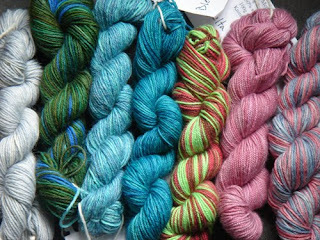 These are the absolutely gorgeous samples that Jane from Serenknitty has sent in for the next NZ Yarn Sampler Box - aren't the colours just beautiful? The shade is Metallic Plum - I just love it! I really must try my hand at spinning so I can see what happens with the fibre. There are two different samples - one is a 10g sample of New Zealand Merino fibre, and the other is a 10g sample of Supersock Select 100% Superwash Merino sock yarn. Love!! Everything is individually made with love and care. Jane explains that her colour inspiration comes from her garden in the Canterbury countryside and the surrounding landscapes. 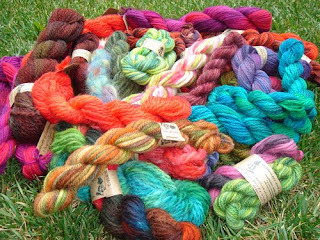 Her hand dyed yarns and fiber are all unique. Custom orders are always welcome. There are a lot of great yarns to check out in Jane's etsy store at http://www.etsy.com/shop/serenknitty, so check them out now. All orders for yarn, fibre or project bags received during March will receive 3 free stitch markers (of my choice). Any order over $75 will ship anywhere for free, postage is capped at $10 for orders under this amount. This will be refunded through Paypal after your order has been processed. Not only can you buy amazing yarns from Serenknitty, but you can buy hand made accessories as well such as stitch markers and also, my favourite thing at the moment - boxy and pyramid project bags! Check them out - I had to buy one as soon as I saw them in Jane's store. I have both a pyramid and a boxy bag - perfect for throwing your sock knitting in when you go out, or I have even been using them as a purse. 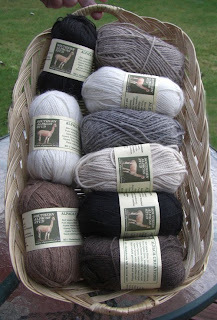 Southern Alpacas Stud are supplying their range of natural alpaca yarns for the next NZ Yarn Sampler Box. Working with Just Alpaca, they supply their alpaca for 4 ply and 8 ply yarns in natural shades – white, light fawn, medium fawn, brown, grey, and black. The samples are generous 50 gram balls! Wow! The 8 ply is 95 metres on 4 mm needles, and the 4 ply 240 metres on 3.25 mm needles. These yarns are 80% alpaca, dye-free, with 20% wool. Enjoy working with these natural fibres. Alpaca can be used wherever you would use wool and the finished article will be lighter, softer and warmer. Once washed, it is suitable for most allergy sufferers. 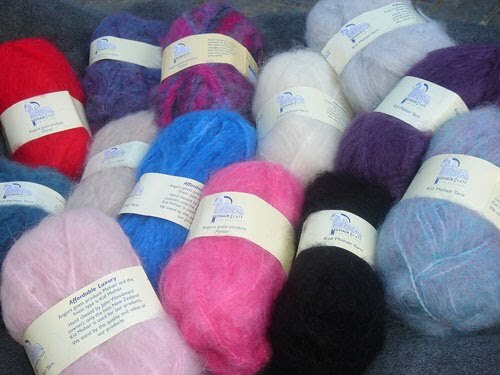 Check out the Alpaca Gallery which showcases alpaca and their fibre, as raw or carded fibre in natural shades, beautiful colourful blends, and fleece converted to yarns, knit kits, felted apparel, and knitwear, plus crafting hints for working in alpaca http://www.alpacasnz.co.nz/fibre.htm, and of course you can buy alpaca fibre, yarns and products here http://www.alpacasnz.co.nz/alpacaproducts.htm. 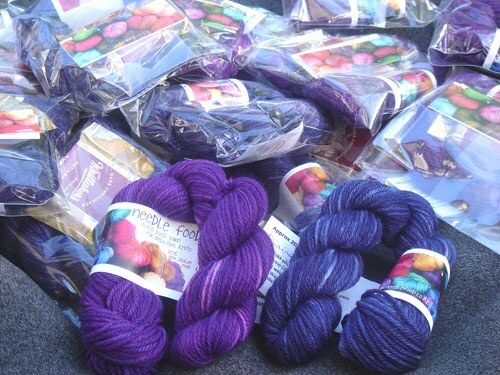 Sock yarn is totally my thing, so you can imagine my excitement when a huge parcel from Knitsch yarns arrived today. You'll have to wipe my drool off your samples, sorry! There are so many fabulous colour ways, and I'm sure they will look extra good when knitted up as they are two threads spun together which gives a slightly shiny effect (4ply sock weight). Knitsch are keen for you all to try out their wool, so they've generously sent enough for all the boxes to have a sample. AND.... one sample has a Golden Ticket attached which earns the winner TWO 50g skeins of Knitsch wool! Wow!! Knitsch sells 100% New Zealand merino hand-dyed sock yarn to really scratch your knitting itch. 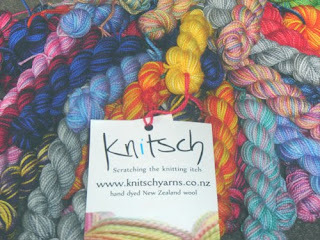 Check them out at www.knitschyarns.co.nz - their 50g skeins are only $12, so go wild - you deserve a treat today. Amazing - check out these beautiful gift tags from the very talented Sarah from Songbird Designs. By now you have probably used your tags from the last Sampler Box on your finished items, so keep your fingers crossed you get a cute pack of these extra cool gift tags in the next box. Each packet contains 3 beautifully crafted tags. If you are in Auckland this weekend, stop by Crafternoon Tea and say hi to Sarah and buy something awesome from her collection of fantastic creations. Crafternoon Tea market is on Saturday 20th of March 2010, from 10am-3pm at the Trinity Methodist Church - which is on the corner of Sandringham and New North Roads in Crafty Kingsland. Curiouser and Curiouser 20% off! 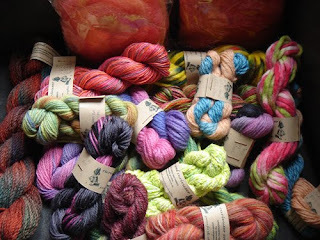 Attention people who bought the January NZ Yarn Sampler Box: did you just love your sample from Curiouser and Curiouser? If so, check the label for a handwritten code - and use this for your next purchase from Sabine's felt store to save a whopping 20%! Have you seen how much amazing stuff is in her store?? 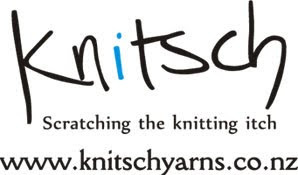 There are 4 pages of delicious yarns - something for everyone. Sock yarn is totally my thing, so I can't wait to see what the samples will be. And one thing I really love about Knitsch yarns is that they come in 50g skeins instead of the usual 100g. That means you could buy two different colourways to make matching-but-not socks, or you could do what I did with my Olympic socks and buy one skein and stripe it with a matching solid colour. 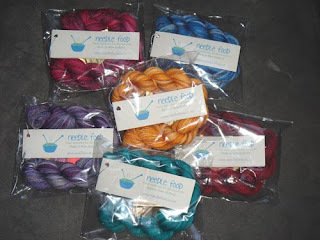 At NZ$12 a skein, just buy a whole bunch of different colours as a gift to yourself (and your stash)! 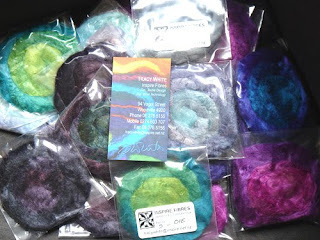 Sari Silk Fibre samples from Yarn Traders! Wow, did your monitor just explode? Check out these colours! 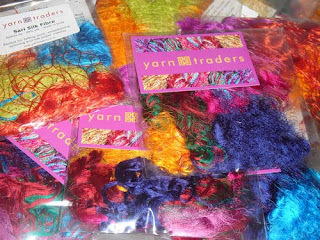 Helen at Yarn Traders has the most incredible products available, and we are extremely lucky to have her included in the NZ Yarn Sampler Box. 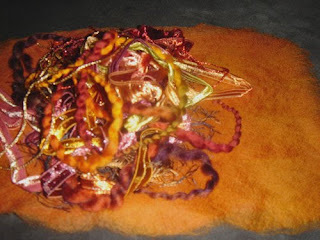 This time, she has supplied amazing bags of Sari Silk Fibre from India, which can be used for felting, embellishing, spinning and silk paper making. The sample bags are mixed, but not necessarily the same. The fibres are rich colours, and very shiny - my mind is already boggling with potential creations where I could use this. 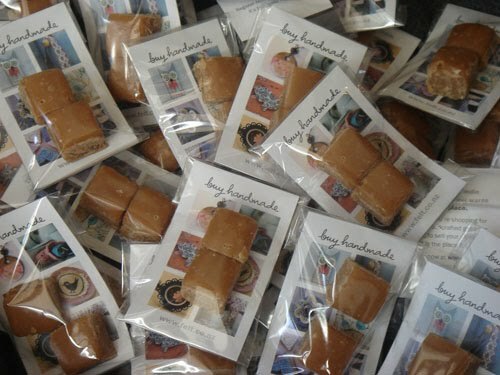 And... Helen has very generously sent enough samples so that every box will receive one! Hooray! Silk hanky samples from Spinning A Yarn! 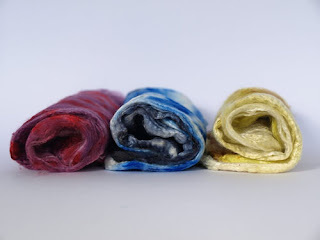 Silk hankies are a versatile and fun fibre to experiment with. They are perfect for beginner spinners, as all the drafting is done before you sit behind your wheel. 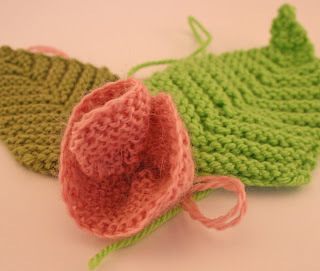 However they are also able to be knitted without spinning, just give them a little twist as you go. Or you might like to incorporate them into a felting project, however they won't felt on their own, so you will need to use them with wool. Maybe you have some left from the last sampler box? http://www.knitty.com/ISSUEwinter05/FEATsilkhankies.html. The length of fibre you will get from this hanky will depend very much on how thin you draft them, you might be surprised by how far they can stretch! To go make them go even further, ply with wool , or even sewing thread. The possibilities are endless- experiment and have fun increasing your daily fibre intake! 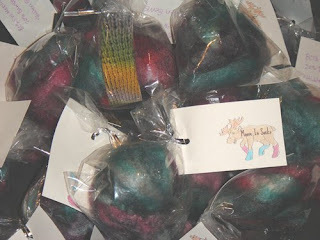 Don't forget to check out the Spinning a Yarn felt store - you will be amazed! Well done! I will contact you for your postal address. There will be another giveaway very soon. That's right - I have lots of goodies to give away! I'm going to run the Songbird Designs competition again because there was an email glitch and I received no entries. So, we have Songbird Designs and Fab Fibres giveaways! 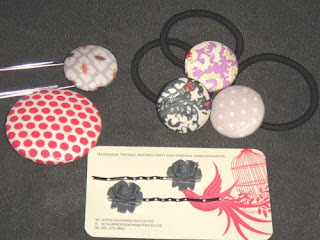 Tweet/Facebook/Blog this: "I want to win these beautiful handmade hair accessories from Songbird Designs! www.NZYarnSampler.blogspot.com @blendy" and don't forget to comment on this post so I know you've entered. Winners will randomly be selected on Wednesday 10 March. Anyone can enter - I'll post your prize anywhere in the world. 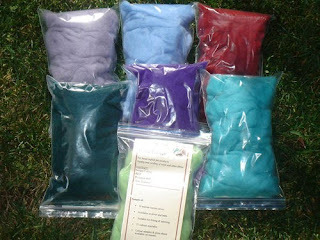 Check out Songbird Design's blog or their felt store to see more tempting gift ideas. The Fab Fibres giveaway is a gorgeous sheet (a bit bigger than A5) of orange hand made wool paper, and a tantalising pile of matching yarns for you to go wild with your creating! 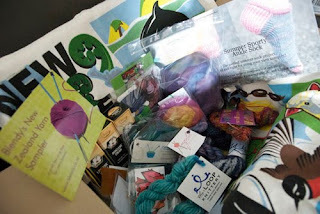 Tweet/Facebook/Blog this: "I want to win the amazing wool paper & yarn pack from Fab Fibres! 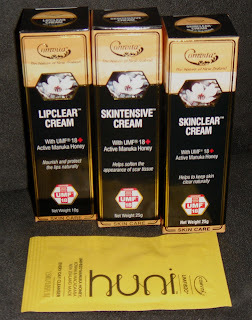 www.NZYarnSampler.blogspot.com @blendy" and don't forget to comment on this post so I know you've entered. Winners will randomly be selected on Wednesday 10 March. Anyone can enter - I'll post your prize anywhere in the world. 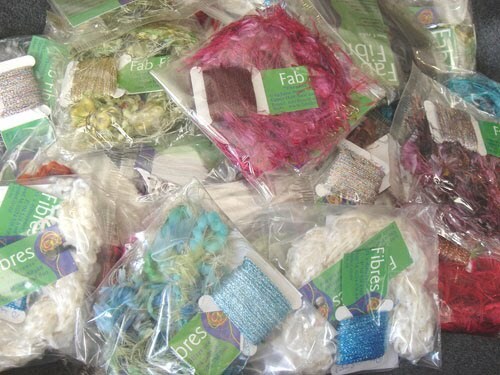 Check out the FabFibres website to see more fabulous yarn, fibres and accessories for your crafts. Well, the Knitting Olympics ended a few days ago. Did I win Gold? No. My challenge proved too difficult, so I've awarded myself a Silver for effort and achievement. 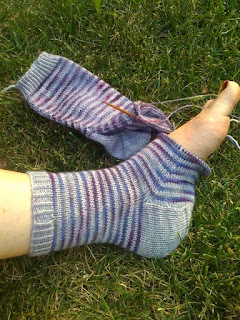 I was attempting to knit two socks at the same time, which in itself is not that challenging, in fact I saw many people complete several pairs of socks, or absolutely ridiculously challenging sweaters. However, my handicap of two small boys and other real life activities prevented round the clock knitting time, but I am very pleased with the progress I made in the time available. Here is my last update picture - this was taken the day before the end of competition, so imagine a few extra stripes added after some frantic knitting during the Closing Ceremony. I think I'm actually not far off beginning the toe. However, as the ceremony ended, and I had not achieved Gold, I was feeling a bit sad (I don't like failing on self-imposed challenges!). Like one of the US Hockey guys said, "You don't win silver, you lose silver". So, what's the best way to lift the spirits of a knitter? Cast on a new project!! So now I am knitting what claims to be a 3 hour sweater, vintage 1930's pattern. While it will take more than 3 hours, I've already completely finished the back. If I continue at this rate, I could possibly have a new sweater by the end of the weekend! Sabine from Curiouser and Curiouser is back in our next box - so many of you loved her amazing and unique samples last time and she has been overwhelmed by your comments. I hope you've made something extra special with your sample. If you didn't get one last time, you have a really good chance this time as Sabine has doubled her yarn sample selection! There are so many beautiful samples of her handpainted art on 100% wool, lambswool/angora blends, silk, possum/merino blend and more. They are all different and all excellent examples of the type of work Sabine creates. I've signed up to be a part of Yarn Harlot's Knitting Olympics! 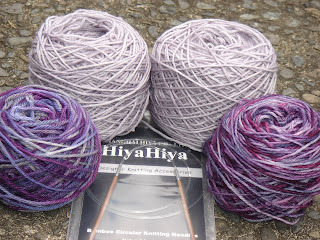 I'm casting on today during the opening ceremony, and will be knitting two socks at the same time on one set of my new HiyaHiya circular needles from Needlefood. I'm using Vintage Purls Sock Club for the main colour, and then for contrast stripes I'm using the Vintage Purls samples from the last Sampler Box for one foot, and Needlefood Lupin for the other foot. I know they are a little bit different, but close enough for a pair of awesome purple stripy socks! So last night I wound them up, but my 11 month old son got in the way and created an enormous tangle that resulted in my lovely husband staying up with me until 1am until we untangled it. That's love!! Zealana have been extremely generous with their sample submissions and most boxes should receive a $15 ball of this luxuriously soft yarn. There are 6 shades from the 'Zealana Kiaora' Rimu range- Powiwi Pink (pinky-red), Toto Red (orange red), Red Rata Tree (rust), Flax (brown), Lake Taupo (blue) and Pukeko blue (blue-charcoal), plus a dusky pink that is 80/20. You will be able to knit something amazing with this, and because it is so exceptionally soft (but very hard wearing apparently), you'll be the envy of your friends, especially if you are from outside of NZ. 'Zealana Kiaora' is a machine washable collection of yarns that focus on the luxurious blends using New Zealands' own Possum fibre. There are plenty of other vibrant NZ-themed colours to choose from as well - go check them out! www.zealana.co.nz Please note that they do not sell directly to the public, but you can order from their stockist KnitWorldStudios. Possum fibre is sourced responsibly and endorsed by the Department of Conservation, with the aim of reducing the devastating effect of possums on NZ's native birds and forests. Check out Songbird Design's blog (with photos of some new items that you can buy at this weekend's Devonport Craft Market), or their felt store, then pick something you love and share the link via your preferred social networking. Comment below with your link (so I know you've entered! ), or tweet me @blendy. Winners will randomly be selected on Friday 19 February. Anyone can enter - I'll post your prize anywhere in the world. Craft fairs have taken a bit of a break over the holidays, so I expect it will be pretty busy at the Devonport Craft Fair this Sunday! 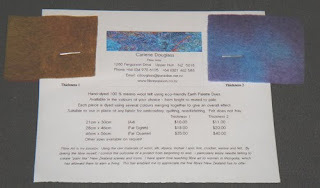 Go check it out from 10.00am - 3pm at the Devonport Community House, Clarence St, Devonport, and tell Sarah from Songbird Designs that you love her stuff and you saw it on the NZ Yarn Sampler Box blog. I hope you've all been having fun doing something creative with your samples from the first box. 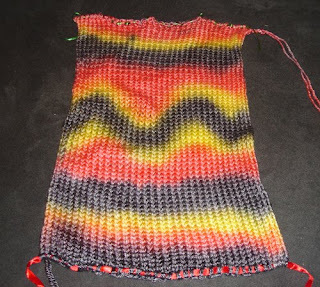 I've enjoyed seeing the finished articles people have posted in our ravelry group. Keep playing with them all, and don't forget to check out the supplier websites and support them buy buying your next project supplies from such amazing crafty people. Register your interest so you can be emailed the time they go on sale, and updates on competitions etc.